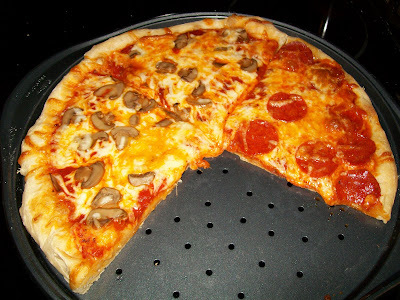 Frugal & Fabulous: Frugal Recipe - Homemade Pizza! Frugal Recipe - Homemade Pizza! DH and I were very excited with how the pizza came out! It was easy, cheap and delicious! I can't wait to make it again! Homemade pizza is so much better than ordering out! That pizza looks so good ! I agree. I make homemade pizza for usually once a week or every other on the weekends. It is WAY better than ordering out and cheaper! :o) If you like some "kick" to your food, I've started adding some "hots" (the little chopped red & green hot peppers) to the pizza sauce, mixing together, then spreading sauce on dough. Also, I don't know if you have a breadmaker, but I make our dough in that and it is SO yummy! :o) Yours came out great! Ok...confession....I've never made homemade pizza!!! I'm going to try this and I will let you know how it turns out. Did you use a certain brand of dough?? When I make pizza I always sprinkle grated cheese and crushed red pepper on top.